Do you cater for Coeliac Disease? At this stage, Jenny Craig does not offer a gluten free menu. Unfortunately, we therefore advise that our menus are not suitable to accommodate your needs for Coeliac Disease. We recommend you seek tailored weight management advice from a dietitian. What if I have other allergies/intolerances? 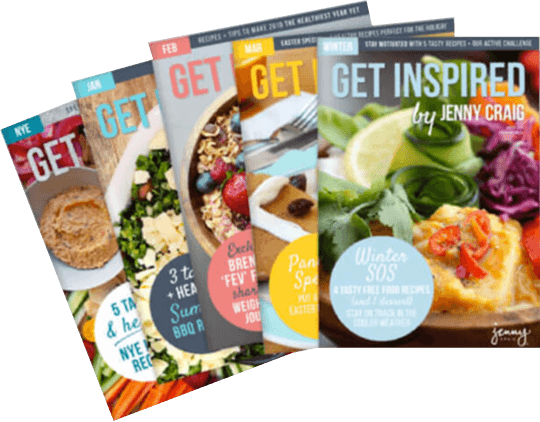 To find out more information simply call your nearest Jenny Craig centre to make an appointment with one of our Consultants who will be able to walk you through our menus and advise on the suitability of the program for you. Find a list of our centre locations per state on our website or you can also call 13 19 92 and you’ll be transferred directly to your nearest centre. I have a health condition that needs a special diet, is the Program suitable for me? Jenny Craig considers your health to be our number one priority. Certain conditions may have specific nutrition or dietary requirements. This is why you will be asked to complete a Health Acknowledgement prior to enrolling on the Program that details your medical conditions, and the suitability of the program will be thoroughly assessed. Simply call 13 19 92 and you’ll be put through to your nearest centre to make an appointment with one of our Consultants. I have Diabetes, is the Program suitable for me? The Jenny Craig program is suitable for people with well-controlled diabetes. We’ve helped many members with diabetes successfully achieve healthy weight management. The portion and kilojoule-controlled meals and snacks are developed to be eaten as part of the dietitian designed Jenny Craig menu. We do consider your health to be our number one priority, so you will be asked to complete a Health Acknowledgement prior to enrolling on the program that details your medical conditions, and the suitability of the program will be thoroughly assessed. Do you have an Adolescent Program? We are proud to be one of the only structured weight management programs to offer a comprehensive program tailored to adolescents 13-17 years old. Adolescents need to obtain written permission from a parent or guardian, and as with all Jenny Craig members, a health acknowledgement must be filled out before commencing the program. The program includes weekly one-on-one consultations, program materials and weekly menus that are specifically tailored to meet the nutritional needs of growing adolescents. Can I do the Program if I’m breastfeeding? Absolutely! We offer tailored menu plans for breastfeeding mothers that accommodate for weight loss as well as increased nutritional needs. For breastfeeding mothers, Jenny Craig encourages a healthy rate of weight loss of no more than ½ kilogram per week. Six weeks after the birth of your baby, we welcome you to make an appointment to see one of our friendly Consultants. During pregnancy, the Jenny Craig menus unfortunately will not meet the increased nutritional requirements for yourself and your growing baby. For weight management advice during this time, we recommend you seek tailored advice from a dietitian. From 6 weeks after the birth of your baby, we welcome you to make an appointment to see one of our consultants. We offer tailored menu plans that promote a safe rate of weight loss as well as meeting your additional nutritional needs while breastfeeding.